Developers in the UAE are increasingly looking into offering more off plan projects that welcome foreign investors and home buyers contemplating long-term living in the UAE. Community living, which has been the dominant residential trend for several years now, continues to attract home buyers. However, affordability remains a challenge across the UAE’s residential market. With household incomes strained by rising living costs, underpinned by inflation levels of over two per cent and the looming new VAT regime, the dream of home ownership continues to drift further away for many. Average incomes remain at around Dh200,000 per annum for expat households across the UAE, based on the Ministry of Economy’s last income survey. According to Cluttons’ Property Report for 2017, most households would be hard pressed to purchase a family home for between Dh600,000 to Dh800,000 anywhere in Dubai. Many buyers who are invested in a long-term stay in the UAE are increasingly looking to purchase off plan homes with a handover time of two or three years, or a mid-market offering in existing affordable communities. Cluttons’ data shows that the number of affordable housing districts in Dubai remains primarily limited to well-known areas such as International City and Discovery Gardens, which together house some 120,000 residents, spread across circa 48,000 units. The limited supply in the affordable segment of the market, coupled with steady, but robust demand, has helped to hold values relatively steady over the last 12 to 18 months. Dubizzle’s most recent report showed that Dubai Marina, Jumeirah Lakes Towers, Downtown Dubai, Jumeirah Village Circle, and International City were the top searched apartment communities. “Apartment communities such as Jumeirah Lakes Towers are preferred by young couples or business people, based on the increase and demand for one-bedroom apartments as opposed to larger units,” Boothello noted. On the other hand, Akoya Oxygen, Mira Reem, and The Villa were the top searched villa communities in Dubai, in addition to more established upmarket communities such as Arabian Ranches and The Springs. Boothello also revealed that the rise of the mid-market property segment indicates a shift from a predominantly cash-based investor market to one of mortgaged end-users. Towards that end, the Dubai Land Department has announced an increase, as the demand and supply for mid-market housing has been on the rise for the past two years. 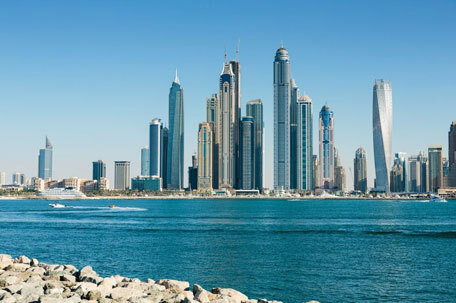 Matthew Green, head of research and consulting for the UAE at CBRE Middle East, noted that waterfront living has grown in popularity in recent months, and that a number of projects have been launched that reflect this buyer preference. Asked about investor interest in neighbouring emirates such as Sharjah, he said that foreign investors are cautiously exploring the opportunities available because the market is still new to them. “When you are launching mega mixed-use projects, it’s difficult to fund it entirely by yourself as a developer, so you need the ability to sell offplan to foreign nationals to access different revenue streams,” he noted. Faisal Durrani, head of research for Cluttons, disclosed that the biggest change that is going to be seen in the property market today is that users are going to see products which will be changed to cater to demand. Cluttons’ experts note that 2018 is likely to see values starting to show their first positive, albeit weak growth, in over three years as the ‘Expo effect’ starts to influence demand levels and overall sentiment. The property markets in the UAE may have faced another tough year, but widespread stability and indeed marginal growth in some segments is expected by the end of 2018.